I came across this magnificent piece at Nikone Gallery in Vientiane.When I enquired about it, Grandma, who had woven it long ago, emerged to tell me about the motifs. The entire space is filled with masterfully interlocking mythical creatures, including sihos, which are half-elephant-half-lion figures, believed to keep away illness and injury. Sometimes an ancestor figure rides on the back of the siho, and if little animals appear inside the siho, it is also a symbol of fertility. Grandma had woven 8 larger sihos pregnant to bursting with baby sihos and other mythical creatures. Whoever owned this piece was sure to have a large family! She told me the little person inside the big sihos was to take care of all the baby creatures. 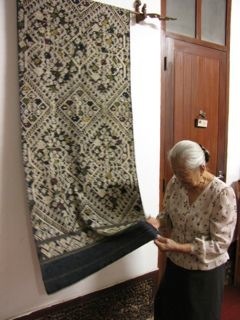 This entry was posted in Laos and tagged ethnic, Laos, siho, Textile, traditional, Vientiane, weaving by Wendy Garrity. Bookmark the permalink.